In Italy someone about to faint with pleasure at the first bite of an especially evocative dish doesn't say with a teary sigh, "It's just like momma used to make." They say, "It's just like nonna used to make," meaning grandma. This isn't only because age, wisdom, and experience are automatically venerated in Italy. It's because grandmothers these days know how to cook better than their daughters, who have been out at work and often rely on their mothers to make family dinners. 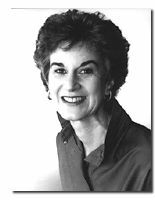 Carol Field, a dear friend and an intrepid explorer of anything cultural, Italian, and gastronomic (in roughly that order), originally wanted to call her new book Secrets of the Grandmothers. Older women's hands and hearts are where everyone's favorite dish can be found, and Carol went out to find them. She traveled up, down, and across Italy, finding dozens of women willing to share the recipes they'd jealously guarded for most of their lives. This was far simpler than if she'd been an inquisitive Italian woman knocking on the kitchen door -- especially a local woman. She was an americana, after all. It would be unlikely for an inquisitive sister-in-law or, worse, daughter-in-law to go shopping in an American bookstore. Her big and wonderful new book, In Nonna's Kitchen, is a portrait of Italian family life and how radically it has changed since the Second World War. Many of the women were shaped by the privations -- and the excitement -- of the war, and the watershed of the country's cooking came after the war, during years of living, above all, on memories. Of course, those memories will die along with the women who guard them. In Nonna's Kitchen is a precious document not just for an American audience eager to learn why Italian food is so soul-satisfying and simple. It's equally precious for Italians who haven't taken the trouble Carol has to seek out the best cooks in the village and ask just how they make their famous specialties. On a cool Boston evening I parsimoniously slice and heat a bit of crostata made with quince or plum marmalade from Giulia's Rome garden and think of a woman who furnishes dozens of relatives and friends with the kind of warmth that only food made with love can supply. When Nella Galletti's mother made this delicious antipasto, she started with large black uncured olives, washed them well, and then put them in a wood-burning oven at the lowest possible heat where they dried for 2 or 3 days until they were dry and deeply grooved with wrinkles. Only then did she rub them with olive oil to soften their skins. My approach is much easier: start with oil-cured black olives and toss them with flavors to make them spicy, perfect to nibble with chips of Parmigiano-Reggiano cheese and a glass of wine. They will keep well tightly sealed in the refrigerator for several weeks. Peel the orange with a vegetable peeler or orange zester, being careful to remove only the zest of the orange rind and none of the white pith. Chop the zest into tiny, tiny dice. Smash the garlic clove with the side of a large knife to remove the skin and chop into very tiny dice. Several hours before you plan to serve them, mix together the orange zest, garlic, pepper, and olives to let their flavors mingle. Leave them at room temperature. If the olives seem at all dry, massage them with just enough olive oil to permeate their skins. Cover them well and they will keep in the refrigerator for several weeks. To store them longer, cover them with just enough oil to cover and keep them moist. Variation: Add l/2 tablespoon slightly crushed fennel seeds. Variation: Add the diced zest of 1 fragrant lemon, such as a Meyer lemon. "See," says Giovanna Passannanti, "Sicily has such incredible ingredients that it is easy for us to make fabulous food." Point proved with this extraordinary addition to an antipasto. You have a choice of sun-dried tomatoes for this dish: you can buy them already plumped in oil or you can refresh them yourself in warm water. Taste your sun-dried tomatoes to be sure that they are not overly salty and look them over to be sure they are without holes. In the south, tomatoes are split in half, sprinkled with sea salt, placed on woven reed mats, then laid on roofs of houses and dried in the intense heat of the sun over the space of a week or two. Then they are put into widemouthed clay containers and immersed in extra-virgin olive oil, perhaps flavored with a little garlic and oregano. In the north, where the sun is not so strong, women dry tomatoes in the oven after the bread has been cooked and the heat has dropped to a very low temperature, leaving them to wrinkle and concentrate their flavors. If you are using dry-packed sun-dried tomatoes, soak them in warm water for 10 to 20 minutes to reconstitute them; pat them dry. If you are using sun-dried tomatoes in oil, barely pat them dry. In a small bowl combine the bread crumbs, garlic, grated cheese, parsley, and 2 tablespoons of the olive oil. Place half the tomatoes skin side down on a clean work surface. Pat 1 teaspoon of the mixture over the top of each, and cover with another sun-dried tomato, skin side up, to make a sandwich. Warm the remaining olive oil in a large sauté pan and very gently sauté the tomato sandwiches for a minute or two on each side. Drain, pat them dry on paper towels and serve at room temperature as part of an antipasto or as an informal appetizer with a glass of wine. Asked to name the archetypal grandmother dessert, the simple sweet that appears at the end of a meal at home, most Italians would answer in a flash: a crostata filled with jam. The dessert knows no regional boundaries: every Italian child grows up eating sweet pastry tarts filled with homemade preserves. When Giulia Tondo makes this recipe, she makes ten crostate, but then, she does everything on a mammoth scale to feed all her children and grandchildren. No wonder nonne inspire such reverence in Italy; it can't be a coincidence that the word for lullaby, the comforting song of childhood, is ninnananna, a term born of the word for grandmother. Since Giulia Tondo makes crostate frequently, she always saves a bit of the dough from the previous one and puts it in the freezer to pull out for the latticework on the next round of tarts. She lets the dough thaw in the refrigerator, so that when she takes it out, it is easy to roll with her fingers and she doesn't need a rolling pin. You will probably not be in the same kind of production that Giulia Tondo is, but you can make this dough ahead and leave it in the refrigerator for a day or freeze it for up to a month. Combine the flour, sugar, baking powder, and salt in a large bowl. Scatter the pieces of butter over the top and cut in with a pastry blender or rub in with your fingers until the mixture has the consistency of coarse cornmeal. Sprinkle the lemon zest over the top. Blend together the eggs, Cointreau, vanilla, and olive oil, and mix them into the dry ingredients until a dough is formed. Knead briefly until it is smooth. Divide the dough into two pieces, one slightly larger than the other. Set a piece of plastic wrap on your work surface, sprinkle it with a tablespoon of flour, take one of the pieces of dough, flatten it into a square, sprinkle a little flour over the top, cover with another piece of plastic wrap, and press down with the weight your body to flatten it a bit. Repeat with the second piece of dough. You may set them in the refrigerator now for 1 hour or 1 day or freeze for up to a month. When you are ready to bake, preheat the oven to 400°F and set the rack on the middle shelf. Lightly oil a 9-inch baking pan. Set the larger piece of dough on a lightly floured work surface. Cut off a piece that is slightly less than one-quarter of the dough and set it aside. Use a rolling pin to roll out the remaining dough into a 10 1/2-inch circle. Fold the piece in half and then in half again and set it in the center of the prepared baking pan. Gently open the segments of the dough; they should cover the bottom and sides of the baking pan entirely. Press them firmly into place with your fingers and trim any pieces that are hanging over the edges. Collect any scraps and incorporate them into the reserved small piece of dough. Spread 2 cups of the preserves to cover the bottom of the dough. Lightly flour your work surface. Roll the reserved dough into an 8 x 12-inch rectangle and use a pizza cutter to cut twelve 1 1/2-inch-wide strips for the lattice. Paint the strips with the egg wash. Save any excess dough for the second pastry shell. Arrange six of the dough strips across the filling in each direction to form a diagonal latticework. Using a knife to loosen the dough that covers the rim of the pan, Giulia folds that dough down over the edges of the crostata in a free-form and charmingly homemade way. Repeat with the second piece of dough but roll it to a 9-inch circle and set it in a well-oiled 8-inch pie pan. Proceed as above. Just before baking, brush all the exposed dough with the egg wash. Bake for about 20 minutes until the dough is golden brown. Cool on a rack. Ten crostate, six pizze Friulane: Giulia Tondo's recipes are calibrated to feed her four children, their spouses, and their six children. She grows peaches, apricots, pomegranates, pears, plums, and mandarin oranges in the garden of her house in the center of Rome. And what does she do with the fruit? She turns it into fifty bottles of fruit syrup so that her grandchildren always have bibite, soft drinks, when they come to visit. Basketfuls of apricots, plums, and peaches become jams for the center of their crostate. In mid-January she even offers them peaches that taste as if they had just been picked off the trees, because Giulia freezes fruits at the height of their summer juiciness and saves them to brighten life during the dreary winter months. Guilia learned to cook when she discovered that her very handsome surgeon husband was regularly eating lunch with one of the fifteen nurses he saw every day. Ernestina, a gorgeous blond, was an excellent nurse who also happened to cook extremely well, and each evening when he came home, Dr. Tondo described what she had made for him that day. "I didn't know how to make anything," Giulia remembered. She herself had trained as a nurse but quit on her fiancé's instruction: young mothers didn't have time for careers. So she set herself on a different kind of training: "I learned to cook," she said, "because I was jealous." She went into the kitchen at seven in the morning and stayed there until he arrived home at one. Every day. Today Giulia Tondo's recipe file is a jumble of index cards taped to the inside of one kitchen cabinet door. The rest is readily available in her head. "My father used to say, 'Don't buy meat if you don't know the butcher as well as you know your brother.'" She clearly took his advice to heart, because although she lives in Rome, she buys almost all of her meat in Vetralla, near Viterbo, where the family has long kept an apartment. She is particularly committed to the sausages she buys there, convinced that their superb taste comes from the pigs' having been raised in a forest of oaks, eating the acorns and chestnuts that fall to the ground. She buys the sausages when they are fresh, hangs them to dry at room temperature before putting them in the refrigerator, and keeps them to flavor tomato sauce and home-fried potatoes. She wouldn't eat a prosciutto that was cured for less than 18 months, a pig that wasn't killed during a north wind when the temperature was low, or a piece of veal from a calf whose life history she doesn't know. Greeting me warmly at her garden gate, Giulia instantly took my arm and tucked it into hers, resting it comfortably at the waist of her soft seafoam-green knit dress. Iron-gray hair pulled back into a bun framed her strong, square face. She walked me with purpose through the garden into the large, modern family apartment. A still-warm iron rested at the end of the ironing board, ready to press heaps of napkins, tablecloths, and soft absorbent towels she made for various family members. They were not brand-new; not only does Giulia make them but she launders them as well for children and grandchildren. Giulia seems the embodiment of the family-centered nonna, one who does everything possible for her children and grandchildren and is deeply involved in their daily lives. She sews for them, knits for them, and cooks endlessly for them. Giulia gets her sense of self from being in perpetual motion, even though she is past seventy-five. She wears no makeup and little jewelry, since they might demand time or interfere with her whirlwind motion. She makes special food for her grandchildren to take to school and on trips, and she fills tins with the hazelnut biscotti one son loves, sending them to him in Sardinia. For her pizza Friulana, a complicated panettone-like bread from Friuli, the northern region where she was born, Guilia still makes her dough with four different additions of flour, milk, and butter. And she makes dozens of crostate a month, turning out that most favored of all homemade desserts with astonishing finesse. Her directions and observations are crystal clear and often expressed with an instinctive feeling for the tactile -- she loves the silky feeling of pasta dough -- and the sensual: she squeezes a starter through her fingers, stirs with her hands, scoops up dough with her whole being. Rolling out pastry dough on a simple cloth she herself cut and hemmed -- it keeps the dough from slipping -- she slides the dough into a round baking pan, spreads homemade jam or marmalade over the bottom, sets a latticework of dough over the jam, and then folds the raggedy edge over the top. "It doesn't have to be perfect around the edges," she remarks reassuringly. "The homemade look is part of its charm." Surrounded by all the food she was preparing, Guilia suddenly put down her rolling pin and disappeared. When she returned, she held up a black silk dress accented by triangular insets of flowered fabric at the tapered waist. It was unmistakably the dress for a smaller Guilia. "You lose your shape when you stop smoking, " she said, "when you get sick and have to take cortisone, and especially when your husband dies. Loving gives you everything, releases everything." She clearly adored her husband. Her love for him still spills over into every facet of her life, warms and embraces every member of her family. She lives for regular phone calls from her children, which she says are like water for plants. If her husband inspired her phenomenal cooking, her children and grandchildren continue to encourage it. When Guilia went to visit her daughter and son-in-law in Houston, she carried a prosciutto inside a box that once housed Perugina chocolates and wrapped three guanciali (preserved pork jowl, a pancetta-like speciality of Lazio) in one of her silk dresses. She swears she cooked for half of Houston. Her daughter's friends wanted her to stay so much that they found her a location for a restaurant and promised to patronize it eternally. Guilia Tondo grew up in a house where both food and culture were important. Her father was a veterinarian who spoke many languages and the family had, as she enumerates them, four horses, three maids, and two motorcycles. But, after facism came, her father took his wife and six children to Argentina rather than compromise people he cared about. The family returned twelve years later. Guilia's love for Italy is clear, as is her immense pleasure in feeding her family. "It's simple," she says. "When I see someone dipping bread into sauce, I'm happy." These irresistable hazelnut biscotti are called tozzetti, literally "stubs" in Italian, for their squat fingerlike shape. During the fall and winter, when hazelnuts from the orchards around Vetralla, near Rome, are fresh, Giulia Tondo, a local legend of a home baker who hones her skill on her grandchildren, keeps a constant supply of these tozzetti in the cookie jar. Giulia will tell you, correctly, that her tozzetti are better than everyone else's, and she'll even tell you her secrets. One is lard, which adds a barely identifiable and wonderful flavor; she uses it only if she knows who killed the pig and when, and she always combines it with butter. (If you can't find fresh lard or don't have the slightest desire to look for it, just butter will work fine.) Another secret is beating the egg whites separately, which paradoxically makes for a more rustic and powerfully flavored cookie. Yet another of Giulia's secrets is adding olive oil to soften the dough, which makes these cookies perfect for anyone who loves the toasted nuts and crunch of biscotti but doesn't want a strenuous jaw workout. Tozzetti are usually melt-in-the-mouth rich. But in this version, Giulia cuts the normal amount of fat and sugar so that her studious son, Leonardo, will have something to munch while writing. These she calls tozzetti da compagnia, because they keep you company while you eat them. 1. Preheat the oven to 350°F. Set 2 shelves in the oven to divide it into thirds. Roast the nuts on a baking sheet in the upper third of the oven for 10 to 15 minutes, or until the smell perfumes the air. To see if the nuts are toasted, cut one in half: it should be golden brown in the center. Leave the oven on and line 2 baking sheets with parchment paper or foil, shiny side up. 2. If using hazelnuts, place the nuts in a tea towel, cover with another towel and rub; the skins will slip off. Transfer the nuts to a plate or a bowl, shake out the towel, and wrap the skinned nuts loosely in it. With the bottom of a heavy pot or a meat pounder, whack the nuts once or twice so they break into chunks -- no smaller than half. Some nuts should remain whole. If using almonds, they need not be skinned and can remain whole. 3. Sift together the flour, baking powder and salt into a small bowl; set aside. 4. In the bowl of an electric mixer, cream the butter and the lard, if using, for about 1 minute. Add the sugar and beat until well blended, about 2 minutes. With the mixer at medium speed, beat the egg yolks, one at a time, waiting about 30 seconds until each is thoroughly incorporated. Beat for 3 to 5 minutes, or until pale. Beat in the lemon zest, oil and vanilla. 5. With the mixer running at its lowest speed, add the sifted dry ingredients in 3 or 4 additions; wait until they are incorporated before adding more. Beat in the nuts just until they are well distributed and begin to break up; the dough will be crumbly. 6. In a clean, dry medium bowl, beat 2 of the egg whites just until very soft peaks form and the whites still look wet. Fold the whites into the dough, mixing well. Don't worry about being delicate -- you just need to make the dough come together. The dough will be slightly wet. 7. With floured hands on a floured surface, roll about 1 cup of dough at a time into logs 1/2 to 3/4 inch in diameter. The length doesn't matter, and the logs do not have to be perfectly round. Slice into finger shapes, 2 1/2 to 3 inches long. Place on the baking sheets 3 inches apart. 8. Bake for 15 minutes, or until set. Remove from oven, brush with remaining egg white, and return to the oven, reversing the baking sheets top to bottom. Bake for 10 minutes more or until browned on both top and bottom. The undersides brown faster than the tops; watch carefully so they don't burn. Cool on a rack. Store at room temperature for 1 week or freeze for up to 4 months. 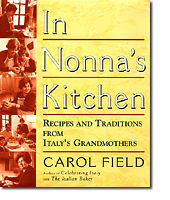 Recipes and profile from In Nonna's Kitchen by Carol Field. HarperCollins: New York, New York 1997. 451 pp. ISBN: 0-06-0171-84-7. $30.00. Copyright © 1997 by Carol Field. Tozzetti recipe from The Joy of Coffee by Corby Kummer. Chapters Publishing, Ltd: Shelburne, Vermont 1995. 192 pp. ISBN: 0-7611-0080-6. $22.00. Copyright © 1995 by Corby Kummer.